One of Australia’s biggest and most reputable insurers, AAMI, has felt the wrath of social media after a botched and misleading ad campaign. The insurer sent out letters to potential customers attempting to entice them into switching their CTP car insurance. 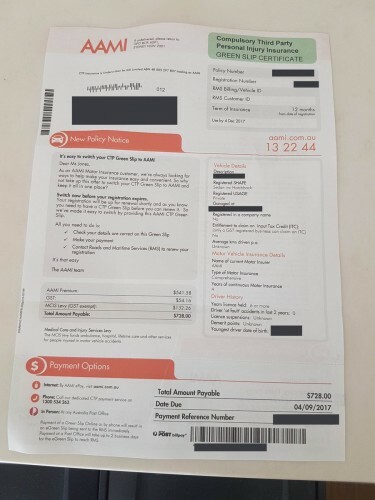 However, the letters looked exactly like an actual bill, with people complaining that people who received the letter could be mistaken into actually paying it. The ad reads: “Compulsory third party personal injury insurance green slip certificate”, including a policy number and a registration number. At the bottom it reads “policy notice”, followed by a final paragraph giving payment options on an amount of $728.00, due on September 4. Leading the complaints charge is Natalie Tran, a comedian and actress who told her 261,000 Twitter followers it was an “ugly way to advertise”, adding she didn’t even own a car. Tran said she “was about to pay it” because she “didn’t think and saw it as a bill”. “My poor parents get these too. It’s an ugly way to advertise,” Tran said. However, AAMI is standing by the ad, telling Fairfax Media via a statement that the letter was sent “to make things easier for customers” and had the approval of the NSW Government. The spokesperson said the offer to switch was “clearly stated in the opening paragraph of the notice”. “This offer is sent to existing AAMI customers in the form of a regulator-approved policy notice (or Green Slip) in order make it easier for them to immediately obtain Compulsory Third Party (CTP) insurance without any additional steps. “The offer to switch includes a personalised CTP quote in the form of a Green Slip. It is sent when their vehicle registration is due. “The NSW Government CTP regulator, SIRA, establishes guidelines for the design of CTP certificates so they can be used as valid Green Slips,” the spokesperson said.